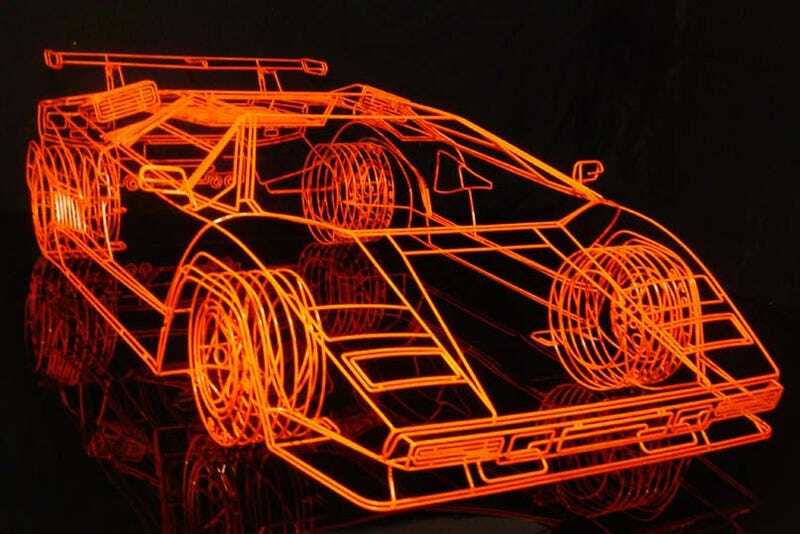 What you're looking at above is not a computer generated drawing, it is a full scale wireframe representation of a Lamborghini Countach created by installation artist Benedict Radcliffe. The car is the latest in a series of wire cars Radcliffe has completed. It's likely the most ambitious, painstakingly crafted from 10 mm steel tube welded together into that familiar shape we all know and secretly love. Upon close inspection you see fine details in the wheels and the intake gills, even the letters spelling "Pirelli P7" are worked out in tubing. We contacted Benedict to find what was behind his impressive creation and it turns out he's a real car guy, and a serial wireframe artist. His story below. I have always been fascinated by cars and from an early age used to go with my god father to brands hatch race track. He belonged to the Aston Martin owners club and so would accompany him to the races. We would often go into the paddock and see all the cars being tuned and tweaked- I'm sure this is where I came across for the first time a Lamborghini, and it made a lasting impression. In 2005 I made my first wireframe car, a Subaru Impreza P1. I called it 'Modern Japanese Classic'. A Subaru was chosen for many reasons; it was at the time a joy-riders favourite, it was my preferred car when playing Gran Turismo on Playstation, but really its charm comes from the fact that despite being very, very fast, underneath the lowered alloys and fat spoilers lurks a family saloon (albeit on steroids!). With the Lamborghini I made it because I just knew the wireframe technique would suit it and it is the most iconic supercar of all time. I had to make it to get it out of my system. It was a fun project, I loved doing the little details like the pepper pot wheels and Pirelli P7 tyres, the Koenig side spoilers and air intakes, and of course the rear spoiler- It looks so simple but it took ages because it's all about the economy of line — too much steel and it becomes unsophisticated and not enough and it doesn't represent it sufficiently. I chose the fluro orange because like the car it is uncompromising! It's aggressive and has attitude. It also looks great when the car is either set in the street or photographed against a white background. The car is currently on display at the Classic Car Club UK, a genius organization with a collection of cars the members collectively drive. If you're interested the Countach is indeed for sale or, if the right opportunity comes along, a lease. We'd certainly drop this beauty into the corporate entry at Jalopnik HQ over some generic piece of post-modern corporate art.